Over the past 3 weeks we have examined the tools that I think are essential for the connected teacher. So far we have looked at Tools For Communication, Tools For Student Collaboration and Tools for Professional Collaboration. To wrap things up we are going to take a look at 4 tools for you to use, with students to create. Animoto-Think of Animoto like Microsoft Photostory on steroids but without the side effects. Animoto is a photo mashup program that has 4 basic steps. Upload your photos, organize and add titles, choose your music, check it over and boom! You have an awesome story that you have told in pictures. There is no having to figure out transitions or other effects, Animoto does all that for you. And now you can upload video. You get 12 seconds per clip which really adds some cool effects to the final product. They have a large library of music to add to your creation and being able to choose the starting point for the music is a big plus. Animoto for Educators offers free accounts to teachers and other educators. All you do is apply with a school provided email address and in a few days you have a 6-month pass for unlimited access. You will also receive a classroom code that you can give to your students so they have unlimited access also. The Digital Classroom-Animoto is a guide I created, walking users through the sign-up process and through the creation of the first video. Creating Poems with Animoto is a great step-by-step on a really cool Animoto project. Podcasting- With the explosion of portable digital audio players (iPod, MP3, etc) there also came the ability for people to record their own audio and distribute it to the masses. Free programs like Apple's iTunes makes it really easy to subscribe to the Civil War Podcast, All About Couches, or My Cat and Me. After podcasts came iTunes U, which allows Higher Ed. and K-12 institutions to post lectures, projects and more. Anyone can create a podcast with a $5.00 mic and some free software. (And now most laptops and some desktops come with mics built in.) For a PC there is a great piece of software called Audacity and for the Mac there is Garage Band. Both allow lots of flexibility for recording, mixing and editing. The beauty with podcasting is that you don't have to have a device to listen to them. You can post them right to your class or school website and they can be played right there. But when you add the device you have endless possibilities, from reading projects to project summaries, there are lots of ways to use podcasts in the classroom. The PoducateMe Guide To Classroom Podcasting is a very easy to follow, step-by-step guide to recording and posting your first podcast. The Education Podcast Network is a great place to start when looking for educational podcasts and examples of how podcasts are used in the classroom. Podcast An Audiobook To Reach A Struggling Reader is just one example of how to use podcasting in the classroom. Voicethread- Say what? Never heard of Voicethread? You are probably not alone. Or maybe you have heard of it but don't really know what it is. Basically one of the coolest programs out there. Oh, yea, its free too. Voicethread bills itself as a Group Conversation application. You upload images to create a show. Then as you are going through the show you can add voice and text narration. When other view the show they can record audio comments or post text comments, for each part of the show. For students, Voicethread really allows for group collaboration and and asynchronous conversations. 17 Ways To Use Voicethread In The Classroom has, well, more that 17 ways to use the program. Tons of great ideas here. Bill Ferriter of the Digitally Speaking wiki has some amazing Voicethread resources he as put together along with some examples of how he is using it for global collaboration. The Voicethread 4 Education wiki has examples from all grade levels, K-12 and curricular areas. There are also some tutorials and a place to connect with other Voicethread users. There are 1000's of other tools used to Create in the classroom. But there are 3, very easy ways to get started. What others do you know of that teachers would enjoy. Leave me some examples in the comments below. I hope you have enjoyed the Essential Tools for the Connected Teacher Series. Next week I will post a document that has all 15 so you can download it and have it whenever you need it. Change? Darn Right We Need Some Change! There are some things in life we can count on. The changing of the leaves. The changing of the seasons. The changing of the guard at Buckingham Palace. Most of these changes are welcomed and expected. Yet when it comes to education and the business of educating children one thing is for sure, change is absent. We, as a society, have become comfortable with the status quo. But there is a movement brewing. On #edchat last night the topic was "Is a Shift needed in education? If so, who is responsible? Teachers? Parents? Administrators? If a Shift isn't needed, what is right with education that we don't need to change." Needless to say I did not encounter one person who said that things in education were going down the right road. I did encounter several who said they see goodness out there, but the over all state of education was headed down the path. You can read more of what participants had to say here and read the archive here. Change 1-Stop Allowing People Far Removed From The Classroom To Make Decisions That Impact The Classroom-Arne Duncan, Fat Cats In DC, And State Lawmakers: It seems ironic to me that you can sit in your comfy chairs and elegant offices and tell me and my colleagues that you know what is best for education and for the children of this country. Frankly, the only people I want, as a teacher and a parent, telling me anything about education are those that have experience. And I don't mean they went to school so they are experts. I mean they are directly involved in education. Why don't you do what we teach our kids to do. Ask for help! If you don't know, don't go in front of some camera somewhere and claim to know. Admit you don't know. Then call me or anyone of my colleagues up to DC or to the state legislature and we will do what we do best, educate you. Tell you what we think is needed. After all, we are with the kids everyday. Change 2- Change Starts from the Top Down-State Administrators, School Boards, District Officials And Principals: It is all to easy to get into a position of power and be influenced by the outside. For those of you charged with overseeing education at the local and state level, its really time for some personal reflection. (I honestly wonder how some can look at themselves in the mirror each morning.) It is time to sit down and truly look at the direction education is taking, and perhaps it's time to stand up and tell those "policymakers" we aren't going to take it any more. Yep, you were right, I am going to mention testing. Testing isn't bad. (WHAT! Did he just say that??) Yes, testing is not bad. Most educators agree that some level of testing is needed. However, the problem is that you place too much emphasis on the testing. (Because the Fat Cats in DC say its important.) We need your support to Shift the emphasis from testing to authentic assessments. Students want to produce, they want to make something that demonstrates their learning. I was talking to an Administrator yesterday who was so excited to hear about a 3rd grade class that was embarking on a year-long project to create their own math textbook. There was integration at all levels including math, language arts, science, history and technology. And yet I said we still are going to test these kids. That project is exactly what is needed. Demonstration of knowledge rather than testing the ability of kids to color little circles. So, you, as Education Leaders need to wake up! Demand change from policy makers. But also demand change of your teachers and provide an environment for that change. Change 3- Change Starts From The Bottom Up- Teachers: I bet you thought you were off the hook with Change 2. To be honest, I hope the real change starts with you. You are in the trenches. You are with the kids day in and day out and see what changes are need. So make them! If you can do something simple to make education better do it. If you can't, make some noise to those that do. Talk to administrators. Go to School Board meetings. Call your legislators. We need to get over this fear that if we raise a fuss we will be fired. There is nothing wrong with wanting what is best for your kids. Its time we all take a stand and say we are going down the wrong road and its time to turn this bus around. Otherwise we will be so far down the road, we won't be able to turn back. All of this is only going to work if 2 things happen. Administrators have to foster an environment of change. (Don't worry, I talked to them about that already. But the question is, do they get it?) More importantly, we have to get away from what is easy in education. It is easy to do the same thing day in and day out, over and over, boring, boring, boring. We have to be dynamic. We have to provide authentic learning experiences for our kids and that starts right there, in your classroom. Be open to and wiling to change. Change 4- Hey Society, We Need You! Parents and Members of the Community: I don't mean more parental and community involvement, although I do. Yes, parents should go to school more often and get to know the teachers and the culture of the school. The community should take a more active role in the school by offering support whenever it is needed, either by volunteering or service projects. The Change that Society needs to make is to turn up the volume. We can complain and complain and complain. But until we unite and go to the people and places we are complaining about, we can't make things happen. So, go out, start a movement, talk to officials, write letters, make phone calls, and vote with your feet. Take a stand against the status quo. Remember, these kids will be taking care of you one day. Wouldn't you want what is best for them? So I guess that is my Change Manifesto, for what its worth. These are just my ideas for Change. What are yours? How, if you were in charge, would you change education? Or would you just leave things the same? I welcome your comments. Photo from Google CC Search. View the original here. 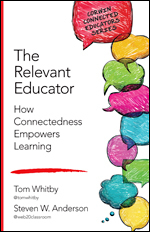 "THE CORE RULES OF NETIQUETTE"
"Bloom's Taxonomy Book Review Questions"
Chartle.net - interactive charts online! "Using Web 2 0 Tools To Enliven Projects"
We are half way through our discovery of those tools that are essential for the "Connected Teacher." In Week 1 we looked at Tools For Communication. In Week 2 we examined Tools For Collaboration With Students. This week we are going to stick with the collaboration theme and take a look at some tools that teachers can use to collaborate with other teachers. 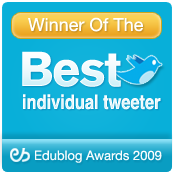 Twitter- Of course Twitter is at the top of my list for collaboration with other educators! People ask me all the time why I use Twitter? What's the point? Think about it this way. It is really a giant educational cocktail party that you can drop in on anytime you are free, and talk to 100's and sometimes 1000's of other educators that are eager to share what they know. The treasures I find there from the people I follow are amazing. For example, yesterday I had an administrator looking for some data on using the Wii in schools. Now, I could do some Google searches and try to find it. I could spend all day looking through material. Instead I put out on Twitter what I was looking for and within 3 minutes I had more than enough data, articles and research that was perfect for what I needed. Every teacher is an expert. Twitter allows everyone to share what they know. Joining Twitter can be overwhelming at first. Trying to figure out what to do and who to follow and where to find great information can be daunting. No worries! Here are some great places to start. 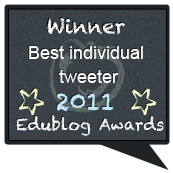 Twitter Help For Educators has tons of links to great sites for getting started with Twitter. There are also some one-click lists for some amazing educators to follow to start building your Professional Learning Network (PLN). Building Your PLN With Twitter- This is a great post from a dear friend of mine (@shellterrell) on how educators can get the most out of Twitter. Twitter4Teachers is the ultimate site for finding other educators. Broken down by grade levels and subject areas, you are sure to find some great gems here. Ning- Huh? Isn't that the sound that my keys make in my pocket? Maybe, but, in addition to that, Ning is the Social Network you create. There are places to put videos, form groups, carry on conversations on forms. One of my Twitter buds, Mike (@fisher1000) describes it as; "The Social Network like Facebook, fully customizable, interactive features, great for teachers/students! (And private!)" The Educators PLN is a newly established Ning that invites educators to join and share. There are groups like Twitter, Elementary Teachers, Pre-Service Teachers, Edtech, ESL and more. There is also a great repository of videos and a huge, collective list of resources for Professional Development. Classroom 2.0 has been around for a very long time and has thousands of members and 100's of groups. You are sure to find something of interest here. List of Educational Ning- Over at the Infinite Thinking Machine Blog there is a great list of Educational Nings, broken down by subject area and interest. Skype- I get so excited when I talk about Skype. For me, this is another "game-changer" in education. Just like Ning and Twitter, educators are not limited to the other professionals in their school or district. They can build and grow their PLN and fill it with educators from around the world. Ning and Twitter provide text-based communication. Messages sent and recieved. But some like a little more interaction and that is where Skype comes in. Skype is a free, downloaded program that lets you call any other Skype user for free. Better yet you can do a video chat, carry out conference calls, send and receive files and do screen sharing. I use Skype for a variety of reasons. I can easily troubleshoot with others in my district, conduct Professional Development without leaving my office, and work with colleagues on various projects. Skype in Education is an amazing resource that has research, articles and of course directories of educators to connect with. There is also a section to connect with other professionals willing to be a guest in the classroom. Tips for Using Skype In Schools has some great information for getting started. Using Skype In School For Dummies is not the best of titles but does have tons of great information on how you can use this resource in school. The Complete Guide To Google Wave is just that, the most comprehensive how-to learning resource for Wave. The Google Wave Cheat Sheet is a handy tool to learn all the ins, outs and tricks with Wave. Google Wave Educators is a directory of other educators who "riding the Wave." I want to stress, using all these can be very, very challenging. I would recommend finding the one that you think you can easily fit into your day. The last thing you want is to jump in without looking and you suddenly find yourself overwhelmed with Social Media and quit. Take it one tool at a time. Ease yourself into the Ning and then join Twitter. Or join Twitter than connect with some people on Wave. Whatever order you do it in, take it one step at a time. These are not all the collaborative tools for educators. What others do you like? Stay tuned. Next week is the 4th and final week. On tap, tools used to create. Image from Google CC Search. View the original here. "TPACK: Technological Pedagogical Content Knowledge"
The good folks at SMART Technologies, the makers of the SMART Board, have given me one copy (1 License, up to 40 Machines) of their SMART Classroom Suite Software to give away. You can read more about the software here. Be sure to check out the product tour. So whats the catch? What do you have to do to get your hands on this software valued at $1299.00? Simple! Create a 1 minute video showing how you use SMART Products. Be as creative as you like! (The more creative the better!) Then post your video to You Tube. When you are ready, come back here and fill out the Contest Form. Be sure to give an email address so we can contact you if you win. The contest starts today and will be open until Dec. 15 2009. The winner will be announced on Dec. 21. 2009 with the winning video featured here. So go, forth! Create your video and win some awesome software! Ten gadgets to make Google Wave more productive - and fun! Last week I introduced you to my Essential Tools For The Connected Teacher, where each week I will give you some ideas of the tools teachers need to have in their Web 2.0 Teaching Toolkit. In part 1 we looked at Tools For Communication. For the next 2 weeks we will look at Tools For Collaboration. Up this week, Collaboration With Students. One of the most important skills we need to teach our students is the ability to work with others; collaboration. What is so awesome is that there are some great, free tools you can use to help foster a "collaboration-rich" environment. Google Docs- How many times have you heard the same, sad story from your students that they forgot their paper at home, they couldn't print it because the Media Center was closed, or they lost their flash drive? With Google Docs there might not be any more excuses. First What Is Google Docs? See how Michael gets help from his friends writing a letter to his "special friend." So as you can see, Google Docs allows for document creation and sharing. Students can collaborate on writing projects and don't need 2 copies. What is even more nifty about Docs is that it is semi-real time. Meaning that if 2 students are making changes to the same doc, as soon as the doc is saved the changes immediately show on all versions. Besides a Document editor there is a Spreadsheet tool, Presentation tool, and a Forms tool which is great for data collection. And all the information collected from the Form goes straight into a Spreadsheet! 21 Interesting Ways To Use Google Docs In The Classroom- In this presentation (using Google Docs) learn some really creative ways to use Docs for learning. Google Docs In Education- From the Google Guys themselves tons of information and ideas on using Docs with your students. 6 Tips To Get The Most Out of Google Docs- Some really good tips here I wish I had when I was starting out. Wikis- Wiki what? Wiki is a Hawaiian word meaning "fast." Wikis are websites that allow anyone with access the ability to create and edit pages, with little knowledge of webpage creation. I tell teachers if you can write a document, you can create a wiki. There are lots of great wiki services out there. 2 of the most popular with educators are PBWorks and Wikispaces. Each has advantages and disadvantages, however they both have wonderful education only features. Wikis In Education- Built on a wiki, learn all the different ways wikis are used in the classroom. Getting Tricky With Wikis- Specific to Wikispaces, this wiki will guide you through the entire creation process from how to add students as contributors to how to add gadgets and do-dads to make it really cool. Educational Wikis- Tons of class and school wikis here to give you an idea on how others are using them. Edmodo- This is a service I just discovered earlier this year after seeing several comments about it on Twitter. Once I got in a played around with it I feel in love and saw the potential. Edmodo Tutorial Video- An introduction to the site and some great information on getting started. 7 Quick Reasons Edmodo Is Great- I am sure there are more, but here are some to consider. Edmodo In A Middle School Language Arts Classroom- Here is the story about how one teacher changed the way her kids were learning and collaborating by using Edmodo. Social Bookmarking- Huh? I remember when this Internet thing really took over. At first you were going to visit a website over and over, you had to remember the address. Then Favorites and Bookmarks were introduced. So it was easy to revisit links, even if you forgot the address. But now we take the Internet with us on laptops and smartphones. In the classroom if you want to do a lesson in a computer lab or on laptops and you had several links you wanted students to visit there was not a very easy way to share those links, until now. With social bookmarking all the links are saved online. So, that means they can be accessed any where you have an Internet connection. (I must confess, I have no bookmarks in my browser. They are all online.) Services like Diigo and Delicious also allow for tagging (or assigning key words) so you can find what you need even fast. Students can create their own accounts and share links for projects and assignments. Social Bookmarking In Plain English- Another great explanation from the Plain English Guys. Diigo In Education- One of the best presentations out there on how to use the powerful education features found in Diigo. Social Bookmarking and Annotating- Tips and Tricks from one amazing teacher on how he uses Social Bookmarking for collaboration in this classroom. So, here are 4 more tools to explore this week and to add to your toolbox. Next week we will look at Tools To Collaborate With Other Professionals. Social Media Causes Social Deficits?? What?